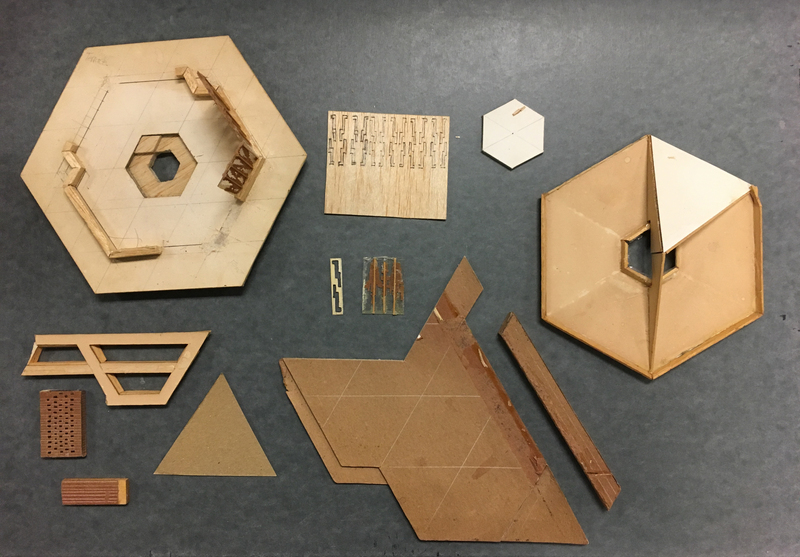 As we continue to research Cranbrook’s recently acquired Frank Lloyd Wright Smith House, new treasures keep popping up. 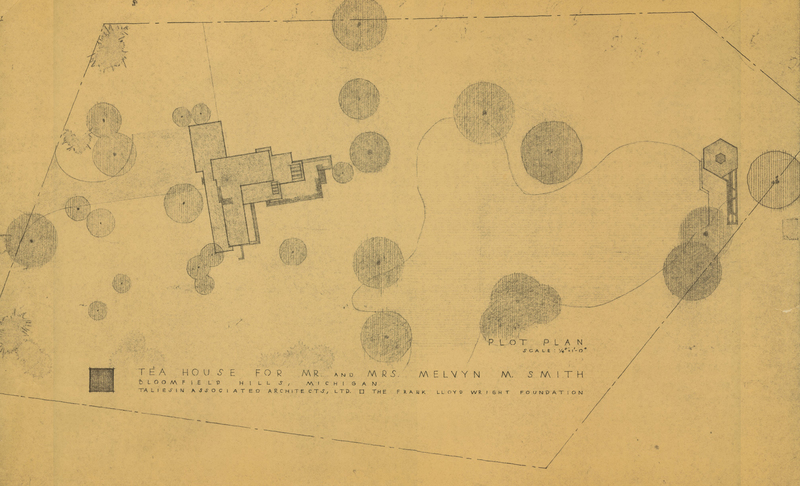 When California landscape architect Thomas Church visited the Smiths in 1957 and sketched out changes to the grounds, he included a small Japanese garden due west of the house. From that point on, Melvyn Smith always pictured adding a small tea house or garden gazebo to the landscape. 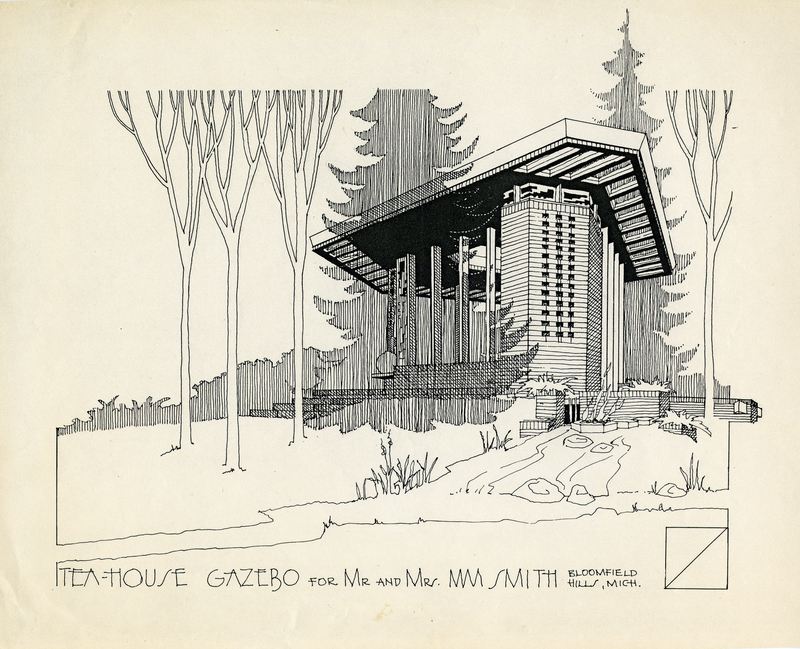 Frank Lloyd Wright’s architecture (including the Smith House) was deeply influenced and indebted to Japanese design: the country’s architecture, landscape, gardens, and art–Wright was one of the foremost collectors and dealers of Japanese prints in America. The Smiths too had a deep interest in Japan (perhaps inspired by Wright’s own interest) and hosted many Japanese visitors to their home over the years. Their photo albums are full of images of Japanese guests and holiday cards from Japanese friends, while in the house sit many items from Japan: sake sets, nabemono pots, and multiple cast iron Japanese teakettles. 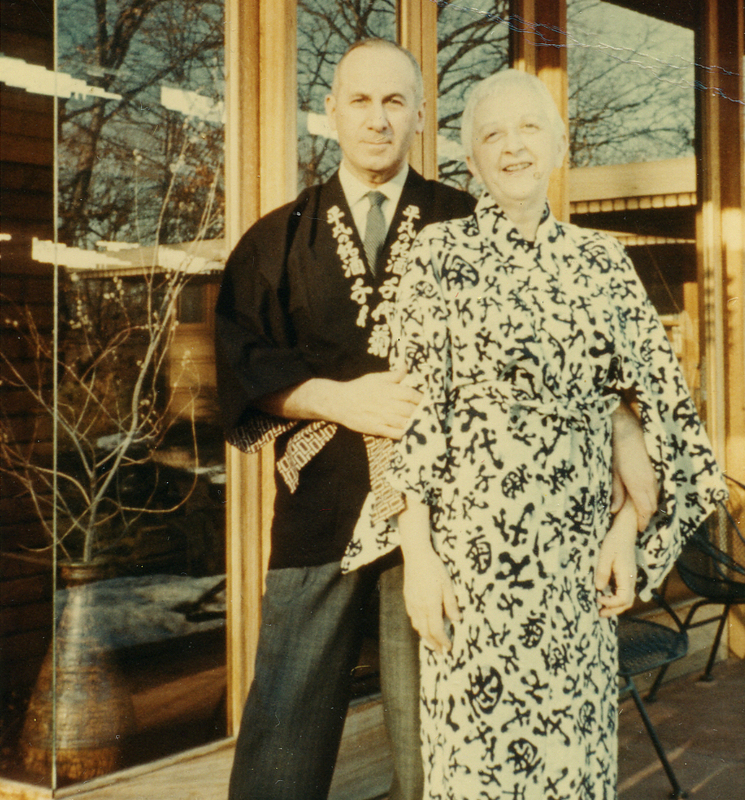 Melyvn (Smithy) and Sara Smith in Kimono outside of their Frank Lloyd Wright home, March 1968. Courtesy of Cranbrook Archives. 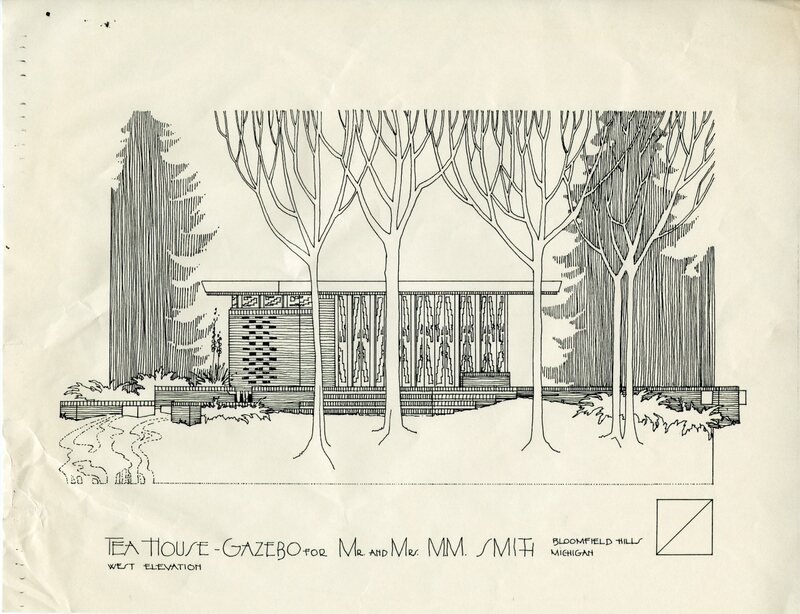 Nothing, however, shows their interest as fully as plans drawn up in July 1965 for a Japanese Tea House to be built across their backyard pond. 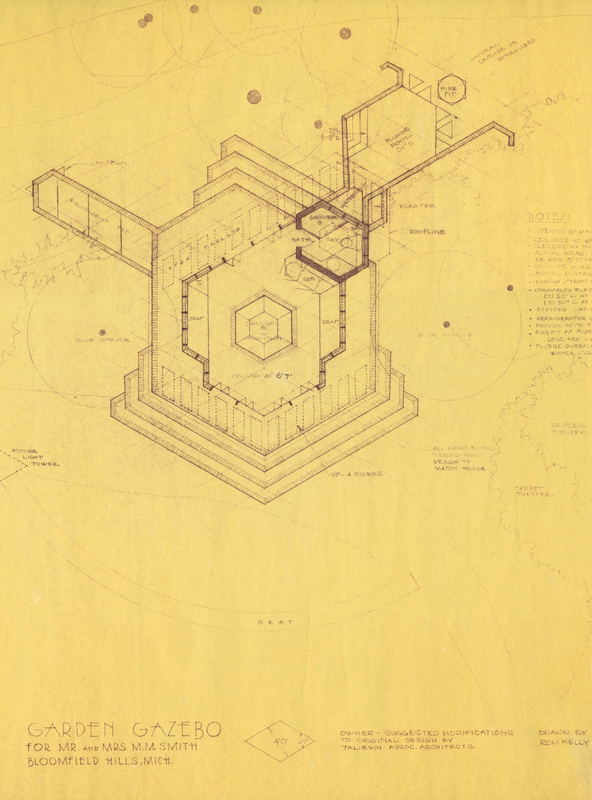 The design was by Taliesin Associated Architects’ William Wesley Peters, Frank Lloyd Wright’s protégé who managed Wright’s office following his death in 1959. 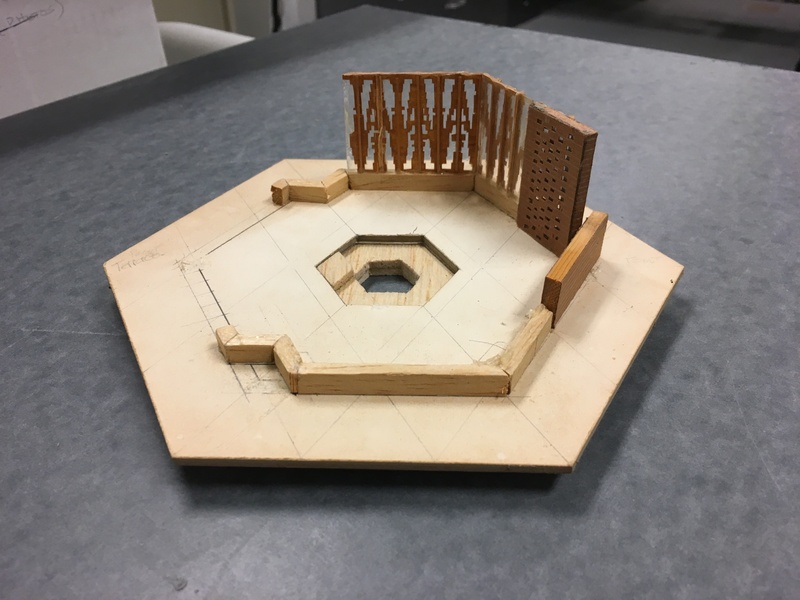 The small tea house, designed on a diagrid, centered on a hexagonal room with six triangular tables (forming a hexagon) surrounded by benches on two sides and tall french doors looking back to the Smith House. Immediately outside was an ample patio and trellis above. Across the rear of the tea house ran vertical louvered panels, pieced by Wright’s earlier design from the clerestory windows of the house. 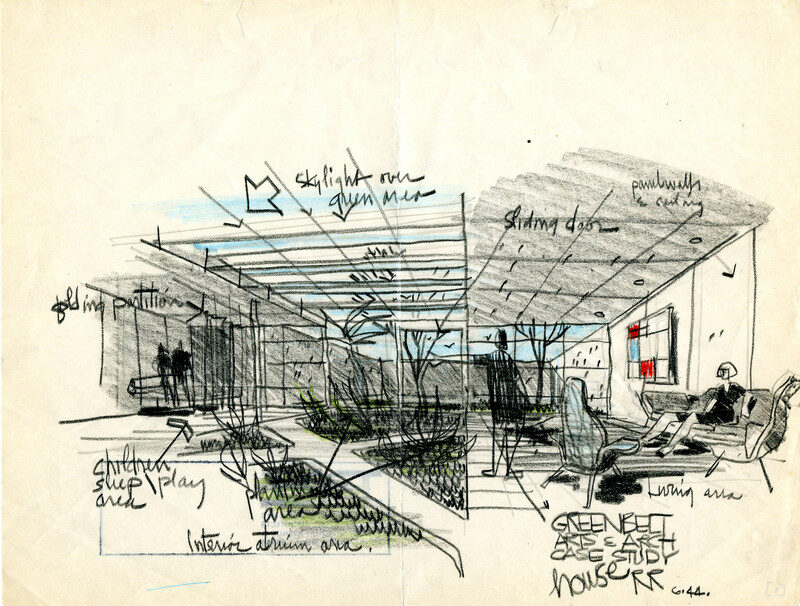 (This system of cut-out folding panels was incorporated in Peters’ 1968 sunroom addition to the main Smith House). 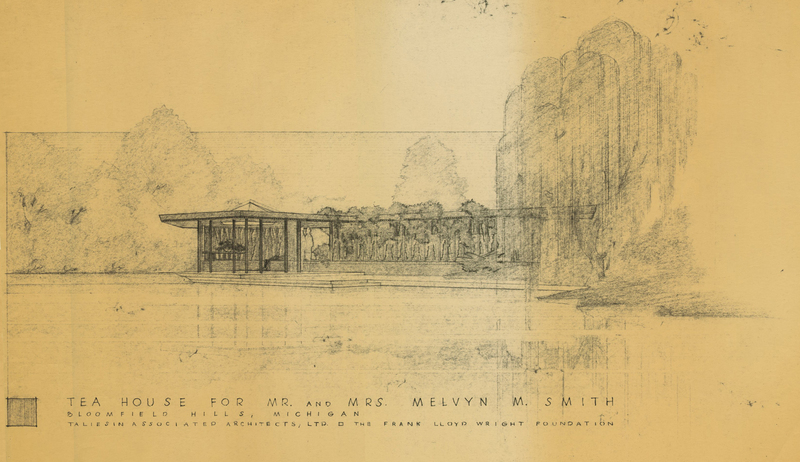 Whether the sunroom addition took funds away from the tea house, or the fact the Smith’s never owned this side of the pond, the 1965 tea house would remain unbuilt. After Melvyn Smith retired from teaching English at Detroit’s Cody High School in 1977 or 1978, he again took up the idea of building a tea house on the property. This time, it would be situated due west of the house where Thomas Church had suggested a Japanese garden and on land the Smith’s already owned. 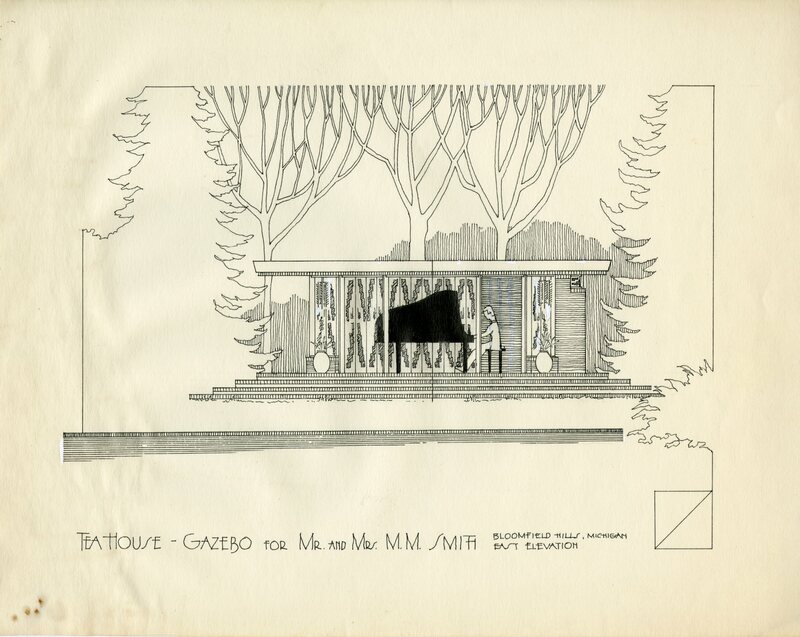 Around 1980 Wesley Peters was again called in to do a design for the tea house. This version of the tea house was taller, featuring french doors flanked by brick walls set with glass openings. Behind the pavilion was a plunge pool for swimming. 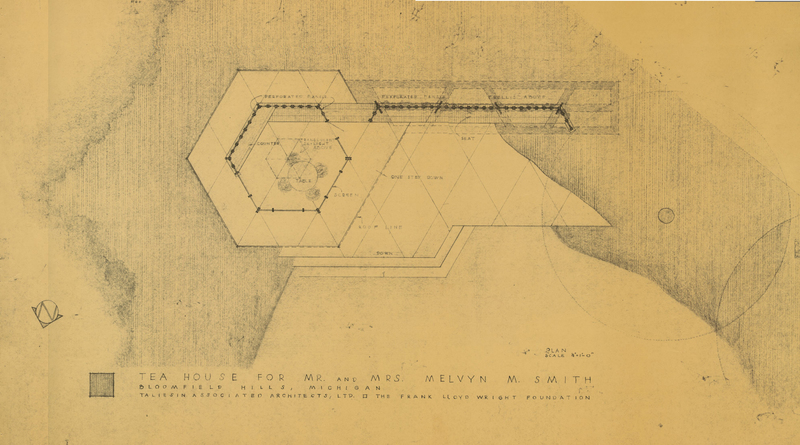 Peters was assisted in this design by Jon deKoven Hill, who joined the Taliesin Fellowship in 1938 and worked there off and on until 1996. Smith fell ill in the Summer of 1984, at the same time revisions to his little tea house were being completed by a local architect or builder Ron Kelly. Perhaps in retirement the purpose of a tea house had changed from purely a place of beauty and repose: the latest versions, reviewed by Smith in the hospital, featured a Jacuzzi sunk within the center of the tea house. Plan of the Garden Gazebo with Jacuzzi at center, plunge pool at top right, and mechanical space top left. Adapted from plans by Taliesin Associated Architects, 1984. Courtesy of Cranbrook Archives. Melvyn Smith died that summer. At his memorial service, William Wesley Peters spoke about the philosophy of architecture; how much Wright had enjoyed Smithy as a client; and paced out the spot for the newly redesigned Japanese tea house. “What else would your dad want me to be doing right now?” Peters asked Robert, the Smith’s only son, who had admired his father’s endless determination to beautify and ornament his dream house. Although there was never any tea house or gazebo built on the property, fast forward to earlier this summer. As we were changing out light bulbs in the high soffits of a bedroom at Smith House, we found two Ziploc bags holding quite the surprise: An unfinished model of the tea house. To learn more about Frank Lloyd Wright and his lifelong relationship with Japan, the Smith’s tea house, and the traditional Japanese Chanoyu tea ceremony, join us next Saturday, August 25, 2018 for presentations and demonstrations at Cranbrook Institute of Science and the Frank Lloyd Wright Smith House. I’ll be delivering a free lecture on Wright at 10:00am, followed by a presentation and Karesansui demonstration by Japanese Horticulturalist Chisato Takeuchi. In the afternoon, there are a few spots left for the 1:30 and 2:30 Chanoyu Tea Ceremony in Smith House presented by the Japan Society of Detroit Women’s Club. More information and registration is on our website. A folly, in landscaping terms, is a ornamental building or tower with no practical purpose built in a large garden or park. Around 1961, Mr. and Mrs. Henry S. Booth placed a small folly on the grounds of Cranbrook. However, for anyone wanting to play a joke on a friend, this folly has a very practical purpose. Weeping Zeus (or more formally Zeus of Otricoli [Roman copy of Greek original]) is a marble bust comprised of the shoulders, chest, and head of the Greek god, Zeus. The chest is carved to resemble draped cloth. The curly hair has a wreath in it, and the beard is curly with a full mustache. The bust is set on top of a concrete block column. This sculpture has an interesting and complex history. It was carved of Carrara marble in Italy in the early 19th Century and soon afterward became a decorative feature of the manor house of Abercairny, Crieff, Perthshire, Scottland. It remained there for well over 100 years until it sold at auction. Henry Scripps Booth purchased the bust in 1961 from Michael Brett of Broadway, England. 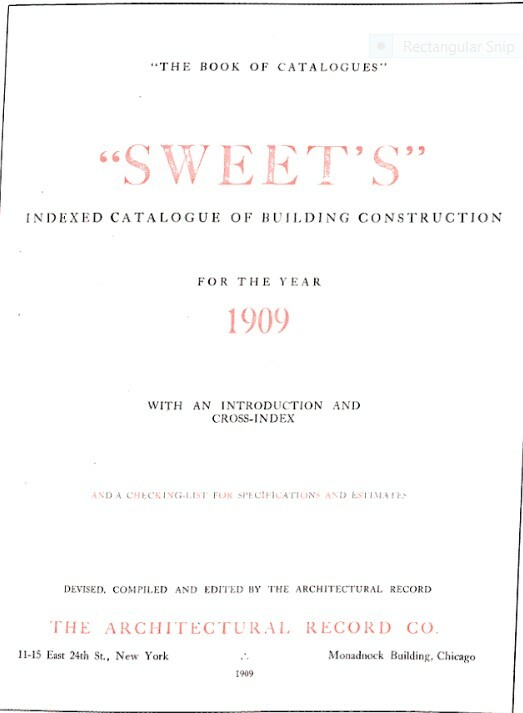 Brett had purchased it from the Abercairny the year before. The manor house, once visited by Queen Victoria, was demolished in 1960, hence the sale of sculptures from the estate. Here at Cranbrook, it would seem the father of the Greek gods finds the peace of this Michigan mountain dull in comparison with the revelries of either Mt. Olympus or his later home in the Scottish Highlands. It is reported tears well up in his eyes and sometimes gush forth. The sculpture became a folly (and why we call him Weeping Zeus) after Henry had holes drilled through the eyes to allow water to flow (squirt, really) out. In reality, he’s not crying on his own. Have your guest stand in front of Zeus while you, as their friend, stand on the special stone that activates water to splash the guest from Zeus’s eyes. As Summer comes to a close, invite that one friend who always pulls tricks on you for a beautiful walk through Cranbrook House Gardens and introduce them to Zeus. Note: Weeping Zeus is located on the Mountain in the Cranbrook House Gardens, up the stairs directly opposite the House’s front door. Cranbrook Gardens is open daily from 9:00 am to 5:00 pm, May 1 through October 31. Admission to Cranbrook Gardens is FREE for the 2018 tour season, courtesy of presenting sponsor, PNC Bank, and sponsors, All Seasons Independent Living, fleurdetroit, and Roberts Restaurant Group. Of the many beautiful works of art and ornament at Christ Church Cranbrook, I have noticed one type is much less documented than others: the misericords. I set out to explore the story behind these little hidden carvings. Misericords are hinged wooden seats that swing up to provide a supportive ledge in the choir stalls of churches and cathedrals—the choir, in the architectural sense, is situated within the chancel between the nave and the sanctuary. Christ Church Cranbrook choir stalls in the chancel taken from the south aisle of the nave, ca. 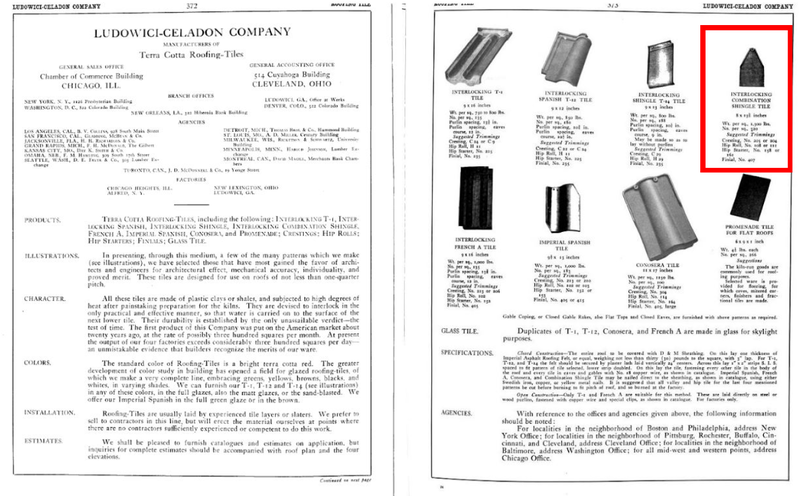 1946. Copyright Cranbrook Archives. The seat appears to be quite ordinary until you lift it up to reveal its carved underside. Traditionally, they were carved with mythological or real animals, foliage, or humorous scenes. The history of misericords goes back to the monastic churches of the middle ages, when the monks spent many hours praying in the choir. Their name comes from the Latin ‘miserericordia’ meaning ‘mercy’ or ‘compassion,’ stemming from ‘misereri’ (to have pity) and ‘cor’ (heart). Misericords were introduced into churches and cathedrals around the thirteenth century, so that elder monks could lean on them and didn’t have to stand unaided for the entire service. 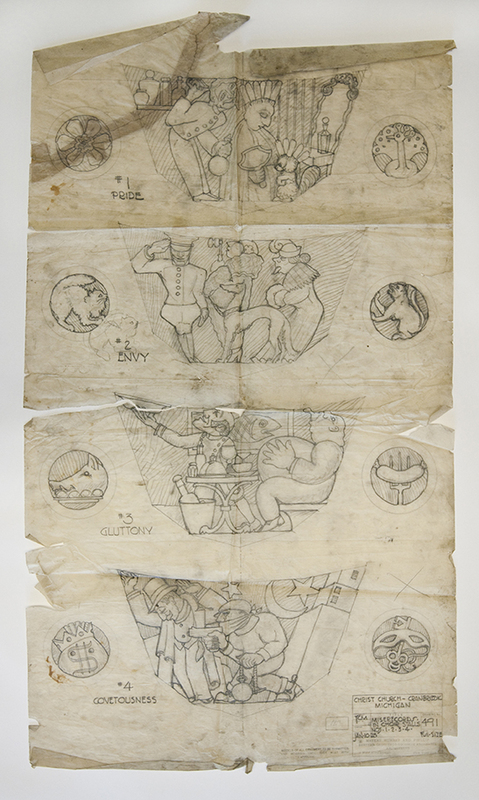 Architectural Drawing for Misericords in Choir Stalls Nos. 1-4 depicting pride, envy, gluttony, and covetousness, January 10, 1928. Bertram Grosvenor Goodhue Associates/Courtesy Cranbrook Archives. The misericord carvings for Christ Church Cranbrook were drawn by a designer with the initials ‘TCM’ at Bertram Grosvenor Goodhue Associates, who were also the architects of the church itself. The carvings for choir stalls 1-7 depict the seven deadly sins (pride, envy, gluttony, covetousness, anger, sloth, and lust). Choir stalls 8-16 depict more contemporary images reflecting life in 1927, including charlatanism in art, politics, machinery, jazz and prize fighting (8-12) and building the church, speed, big business, and prohibition (13-16). 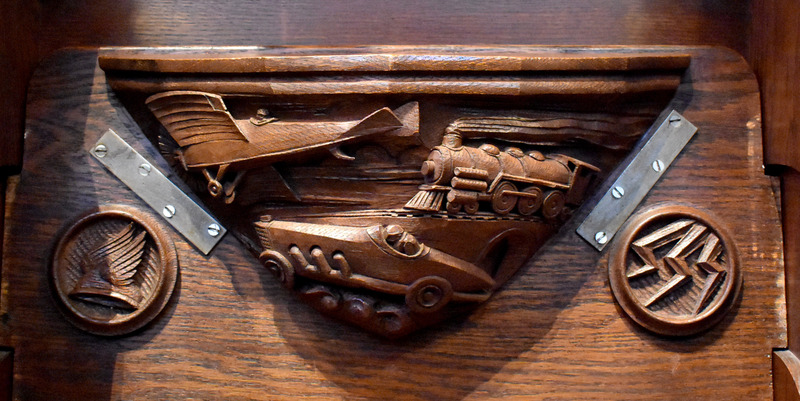 Misericord depicting “Speed,” represented by different modes of transportation (choir stall 14), the metal braces are a later repair. Courtesy Cranbrook Archives. 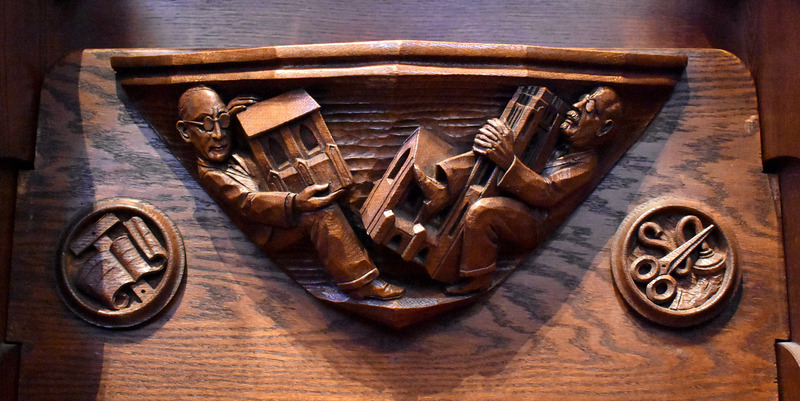 Misericord depicting Oscar H. Murray and George Gough Booth lengthening the church (choir stall 13). Courtesy Cranbrook Archives. 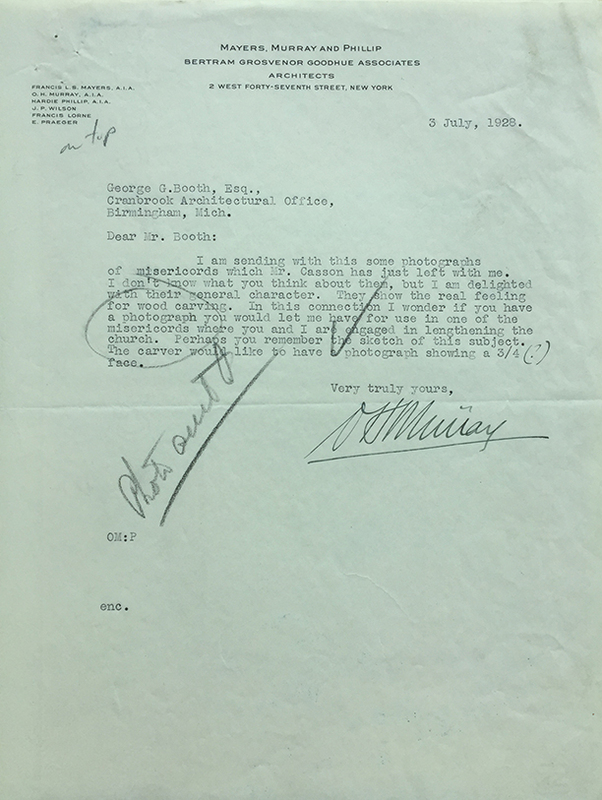 Letter from Oscar H. Murray to George Gough Booth regarding the misericord showing the building of the church, July 3, 1928. Copyright Cranbrook Archives. The letter tells us that the carver used a photograph of George Gough Booth (depicted on the right side of the misericord) to help with the details of the carving. The misericords were carved by Irving and Casson of Boston, who also carved the screen between the narthex and the nave and the canopied vaulting above the choir stalls. However, the name of the carver is not recorded. 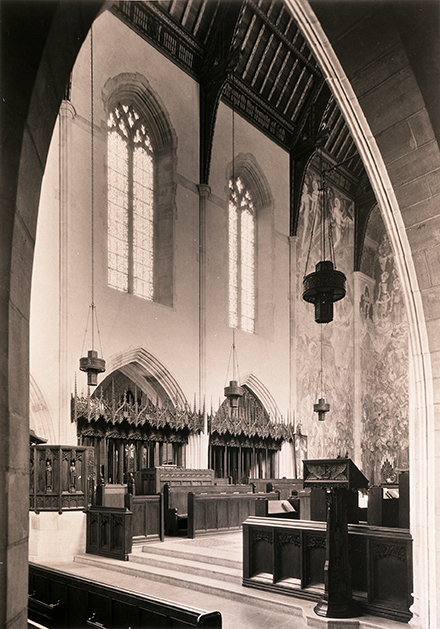 Christ Church Cranbrook is celebrating its 90th anniversary on September 29. Also stay tuned for our ‘Ecclesiastical Structures of Detroit’ Day Away trip in the fall.